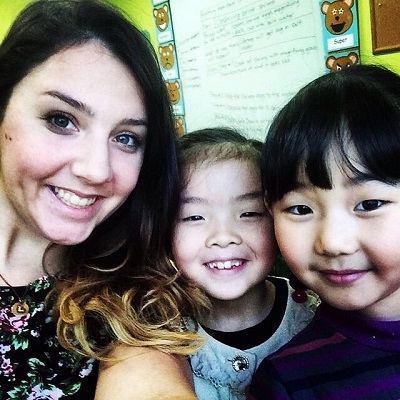 ITA Alumni Ambassador, Laura Nalin, takes over the ITA Instagram Story to show us a day in her life living and teaching English in Ho Chi Minh City, Vietnam. Xin chào from Vietnam. My name is Laura and I'm the ITA Ambassador for Ho Chi Minh City, Vietnam. I'm just currently on my roof having my morning coffee and I will show you the view in a minute. So there are actually 24 districts that make up Ho Chi Mihn City so it's quite large. Nineteen of those are central districts and five of them are suburban. I'm currently based in District Four, which is the smallest urban district in the city. The weather in Saigon is super hot and humid. It's not even seven in the morning and it's 82 degrees already and extremely humid. I am already sweating. But I just wanted to show you how people go about their day here. So the primary transportation here is motorbike and I will show you mine in a little bit. That's actually how I get to work. But check out my neighborhood. So, I'm about to head into work a little bit earlier than normal because I forgot to get gas last night. So I'm hoping that I can ride my motorbike to work without it breaking down. Made it. There's a gas station. 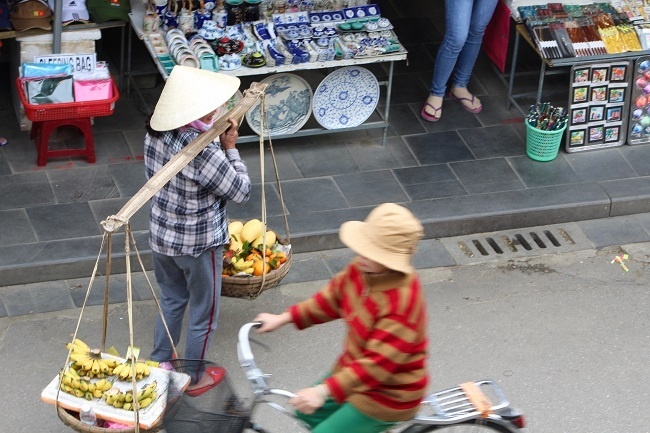 This is what the typical morning commute in Ho Chi Minh City looks like. I have about 20 minutes until I need to check in to work. Usually I get there a little bit early and just make sure I have everything planned and prepped for the day, but since it's the end of the school year, everything's pretty much done. So I'm at the park. I'll show you. I'll tell you a little about me. 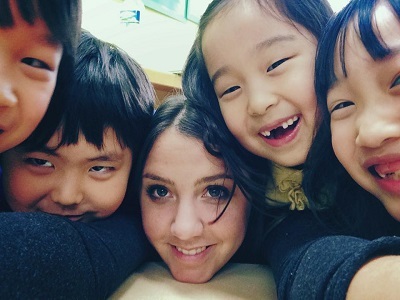 I used to live in South Korea, where I taught English for two and a half years and then I moved to New Zealand and now I'm in Ho Chi Minh City. And I actually much prefer Vietnam than I did Korea. While I was able to save up a ton of money in Korea, I saved up 25 thousand dollars in two and a half years, the work life balance was not the type of life that I was happy with. 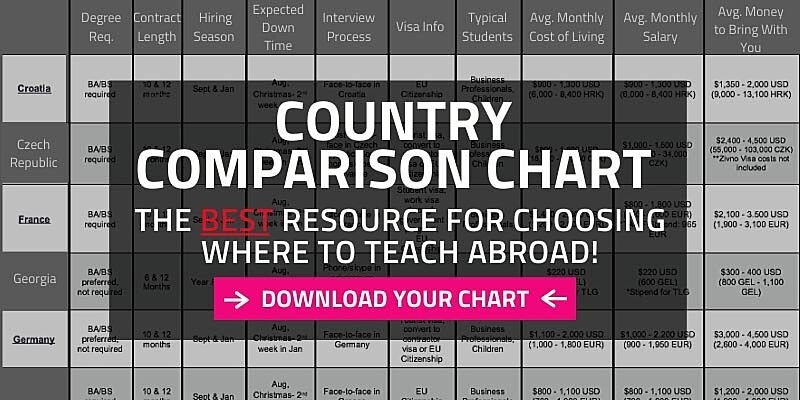 So I work in the public school system here as a grade one teacher and I make 49 million Vietnamese dong per month, which is about just a little over two thousand USD. In that time, I teach 12 hours per week. It depends on the day. Sometimes I teach three hours, but for instance, today I only teach in the morning so I will be showing you around Saigon this afternoon. So I've just got to work and while the kids are playing before school starts, I'll show you what that looks like. Okay, so I have finished work and now I'm gonna be walking around and showing you some of my favorite places in Saigon. I'm gonna start by going to my favorite fruit lady and pick up some watermelon. One of my favorite places, one of my favorite buildings, really, in the whole city. It is the Saigon Post Office. Check it out. Now, at the Notre Dame Cathedral. And it is under a little bit of construction but look how absolutely stunning it is. I just love this part of town. 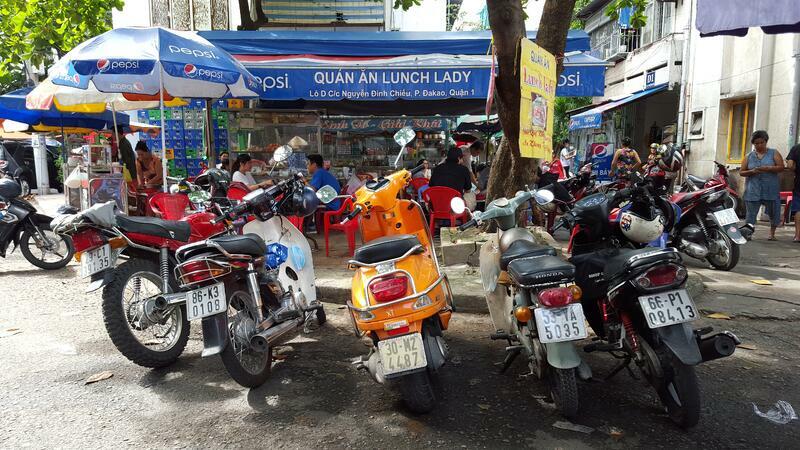 So just in case you were wondering what a Vietnamese parking lot looks like, this is it. Endless motorbikes. For obvious reasons, I cannot hold my phone and drive in this crazy traffic but we're going to some cool places, some markets and some other really awesome buildings. So, let's go. This is one of my favorite cathedrals in the entire city. It is just a ridiculous pink. Palm trees, it's off of one of the main roads, which is really unique. I love it. All the patterns. The sun is so bright, so you can't really see the pink, but. Oh, man. Alright, guys, so I'm actually dying. It says that it's 92 degrees, but my weather app says that it feels like 105. The sun is so strong. It's so humid, so hot, so I apologize for this. 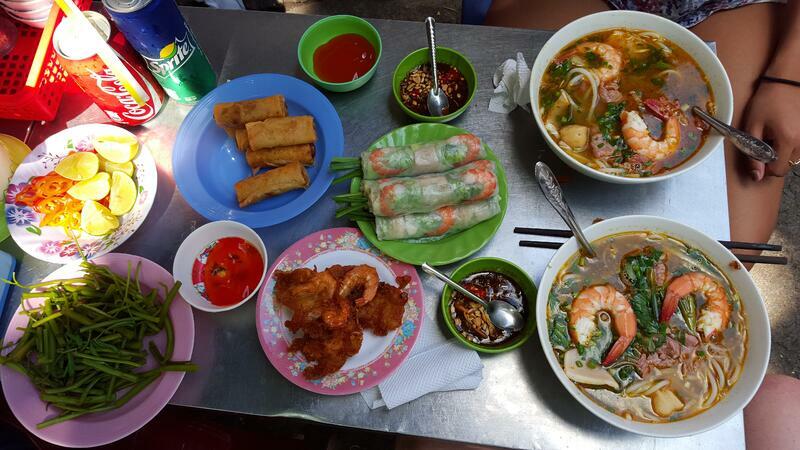 So we are at the Benthanh Street Food Market. There are a ton of different types of cuisines here. I'm gonna get my lunch but first I'm getting a juice because I am so thirsty. But then I'll show you around after, 'kay? Hello. Alright, now we're in Phuc Long. It is the Vietnamese Starbucks, basically. That's what it looks like. They have all these types of coffee and some tea over there. So as you can see, the traffic here is pretty wild. That's not even rush hour, so that's actually pretty tame. If you are nervous about driving your own motorbike here, I promise you it's really not that difficult. It actually took me nine months to get on my own motorbike. Before that, I just used an app called Grab, which is basically a motorbike taxi. It's exhilarating. It's awesome. So, you do not have to ride a motorbike here if you're not comfortable. While we are on the subject of motorbikes, my least favorite thing about driving a motorbike is parking because, as I showed before, parking lots look like this. So it can be pretty horrific and frustrating. If you're wondering why it's frustrating, it's because motorbikes can be extremely heavy, depending on the make, and they're pretty bulky. So they can be hard to fit in the spot and take out of the spot but the locals are always more that willing to help, so it's wonderful. Every single parking lot costs five thousand dong, which is about 21 cents and my long-term monthly parking spot at my job is $7 a month, which is awesome. They have this store. It's called Lock & Lock. You can get some knives, scissors, spatulas, spoons, pots, pans, colorful pots and pans, basically, anything you want. You can get it here. The main reason I was in that store is because today my water bottle broke and so I got a new one. Yeah, but now that I'm here, I'm gonna show you what the rest of the mall looks like. And this level is Mango and then down there, we have Old Navy, there's the Gap, some jewelry shops, shoe stores, watches. There we have Dior and Clinique, Mac, Zara, Innisfree, which is my favorite Korean skin care. The Face Shop, which is also Korean. See, here's some jewelry and a random dress shop. I've actually never been in there. And Swasky, Pandora. If you like those bracelets, you can get them here. Over here, we have Pull & Bear, which is great for patterns if you like patterns. They often have a sale. And then here we have H & M, which is where I'm going next. This is a definite perk to have a Western amenity like H & M. But if you are larger than a size eight or 10, depending on the store, I would definitely bring your own clothes from home because this country doesn't really cater to Western bodies. If you're a man and you're watching this, I'm really sorry. I have no idea about the male clothing sizes but I do know that it's pretty difficult for a lot of men to find shoes and socks here, so remember to pack those. And ladies, if you have larger than a 7-1/2 or 8, bring your own shoes. You can definitely get shoes made her, custom made, it's awesome, but it's not as easy, and just bring them from home. Alright, it's the end of the day, so I'm at the gym. Costs about 70 thousand Vietnamese dong for one drop in, which is three US dollars, or 1.38 for three months, which is 60 USD. Can't beat that. Alright, so I'm back at my house and I'm just waiting for my groceries to be delivered and then I'm going to just chill out. To everybody who followed along today, thank you so much. I hope I gave some insight on what it's like to be an ex-pat here in Saigon.